319 Beacon is located on the south side of Beacon, between Exeter and Fairfield, with 315-317 Beacon to the east and 321 Beacon to the west. 319 Beacon was designed and built in 1871-1872 by Frederick B. Pope for speculative sale, one of fourteen contiguous houses (303-305-307-309-311-313-315-317-319-321-323-325-327-329 Beacon) he designed and built in the early 1870s. 311-313-315-317-319 Beacon are designed as a symmetrical composition. 311 Beacon and 319 Beacon are wider (on 24.5 foot lots) with bays (311 Beacon’s bay on the east side of the house and 319 Beacon’s bay on the west side). 313-315-317 Beacon are narrower (on 17 foot lots) each with an oriel window on the second floor. 313 Beacon and 317 Beacon have three dormers; the entrance to 313 Beacon is on the west, and the entrance to 317 Beacon is on the east. 315 Beacon forms the center of the composition, with a more elaborate mansard roof, set forward with a single, central double dormer window. The entrance to 315 Beacon has been removed – probably when it was combined with 317 Beacon in the early 1900s – but originally may have been centered on the façade. 311-313-315-317-319 Beacon were built on a 100 foot wide parcel of land originally sold by the Commonwealth of Massachusetts at public auction on December 24, 1868. Dry goods merchant Eben Dyer Jordan, co-founder of the firm of Jordan, Marsh & Co., either was the successful bidder or acquired the right to purchase the land from the successful bidder. 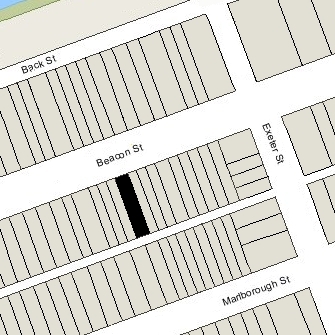 On April 25, 1870, Eben Jordan entered into an agreement with Frederick Pope under which Frederick Pope agreed to build at 311-313 Beacon “two Connecticut freestone front dwelling houses, one house to be twenty-four feet six inches wide, and the other to be seventeen feet in width, and of the dimensions and arrangements described by plans and specifications signed this day.” In the same agreement, Eben Jordan agreed to sell Frederick Pope the remaining land, to the west of 311-313 Beacon, with a frontage of 58 feet six inches. On October 17, 1870, the Commonwealth conveyed Eben D. Jordan the eastern 50 feet of land, and on October 25. 1870, he conveyed the western 8 feet six inches to Frederick Pope. Frederick Pope acquired the remaining 50 feet to the west directly from the Commonwealth as two 25 foot wide lots, on October 10, 1870, and October 27, 1870. Once the houses were built, Eben Jordan sold 311 and 313 Beacon, and Frederick Pope sold 313-315-317-319 Beacon. Click here for an index to the deeds for 319 Beacon. Frederick Pope briefly made 319 Beacon his home. He was unmarried. His parents, Samuel and Sarah H. (Stetson) Pope, his sister Sarah E. Pope, and his brother, Eugene Alexander Pope, lived with him. They all previously had lived in Cambridge. By 1872, they had moved to 309 Beacon. On October 13, 1871, 319 Beacon was purchased from Frederick Pope by Margaret (Chapin) Bliss, the wife of William Bliss. They previously had lived at 103 Pinckney. William Bliss was general freight agent of the Boston and Albany Railroad and would later become president of the company. They continued to live at 319 Beacon until about 1874, when they moved to Springfield. On June 29, 1874, 319 Beacon was purchased from Margaret Bliss by Frances Emily (Carruth) Pratt. The wife of Elliott William Pratt. They previously had lived at 9 Beacon. Elliott Pratt was an organist and music teacher. By the time of his death, he was a trustee of estates. The Pratts were living elsewhere during the 1884-1885 winter season, and 319 Beacon was the home of Sarah Hickling (Webster) Dabney, the widow of John Pomeroy Dabney, a shipping merchant in the Fayal trade. Their son, John Pomeroy Dabney, Jr., lived with her. By 1886, she had moved to 3 Mt. Vernon Place, and by 1888 to 395 Beacon. He moved to Chicago. 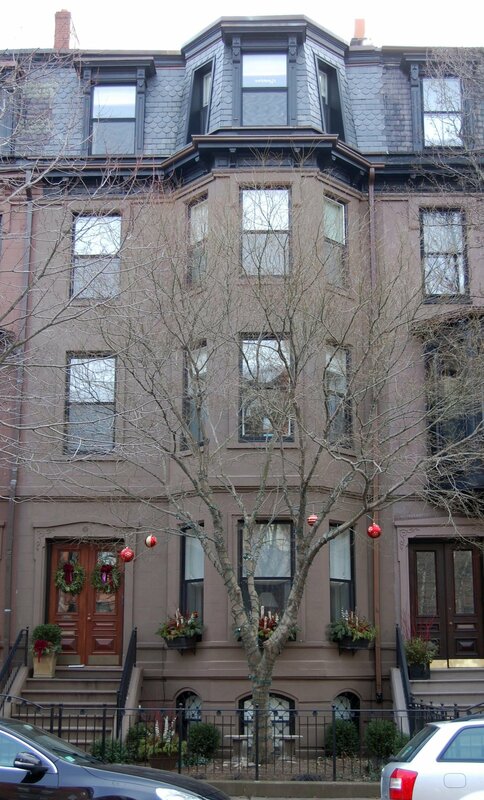 By the 1885-1886 winter season, the Pratts were again living at 319 Beacon. Elliott Pratt died in February of 1905. Frances Pratt continued to live at 319 Beacon with their daughter, Emily Frances Pratt. Emily Pratt married in November of 1905 to Stephen Bowen, a textile manufacturing engineer and later president of the Saxony Knitting Mills. He had been married previously, to Annie Rose, who died in March of 1900. After their marriage, Stephen and Emily Bowen and his daughter by his first marriage, Annie Rose Bowen, lived at 319 Beacon with Frances Pratt. Emily (Pratt) Bowen died in December of 1918. Stephen Bowen continued to live at 319 Beacon with Frances Pratt. His daughter, Anne Rose Bowen, lived with them until her marriage in October of 1926 to Atherton Loring, Jr. In 1926, the house was damaged by fire and, in December of 1926, Frances Pratt filed for (and subsequently received) permission to repair the damage. Frances Pratt died in May of 1929. In her will, she left 319 Beacon to Stephen Bowen, who continued to make it his home. During the 1929-1930 winter season, Stephen Bowen was living elsewhere and 319 Beacon was the home of Miss Dorothy H. Moulton and Miss Helen L. Kelley. Stephen Bowen had resumed living at 319 Beacon by the 1930-1931 winter season, joined by his son-in-law and daughter, Atherton Loring, Jr., and Anne Rose (Bowen) Loring. They previously had lived in Brockton. They continued to live with him until the late 1930s, but had moved to Duxbury by 1940. He was a special agent for the New England Telephone & Telegraph Company. Stephen Bowen continued to live at 319 Beacon until his death in March of 1948. He also maintained a home in Milton. On October 20, 1948, 319 Beacon was acquired from Stephen Bowen’s estate by Mrs. Anne S. French, who operated it as a lodging house. She continued to live there until about 1954. On March 10, 1954, 319 Beacon was acquired from Anne French by Luykx Incorporated (Dirk J. Luykx, president). 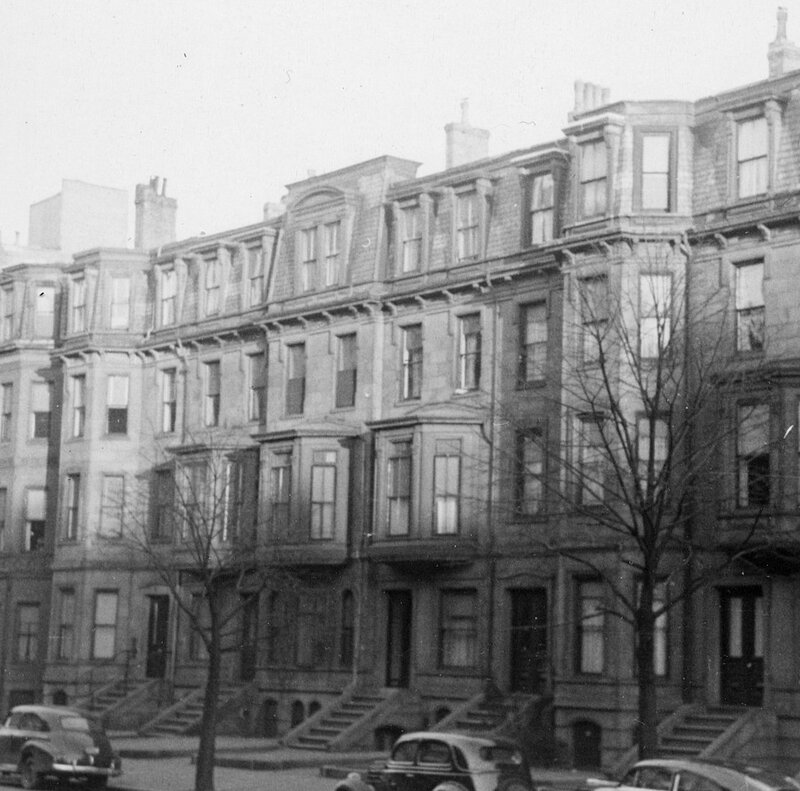 In February of 1954, Dirk Luykx applied for (and subsequently received) permission to convert the property from a single-family dwelling into ten apartments. He was an architect. The property changed hands and on November 22, 1968, was acquired by Thomas Francis Twomey, trustee of The Plane Trust. He was a commercial airline pilot and lived in Moultonboro, New Hampshire, at the time he purchased the property. Thomas Twomey died in February of 2003, and on November 4, 2004, Carol Fulton, as successor trustee of The Plane Trust, transferred 319 Beacon to Mellon Trust of New England, trustee of the Thomas Francis Twomey Revocable Trust. On February 27, 2007, 319 Beacon was purchased from the Thomas Francis Twomey Revocable Trust by the 319 Beacon Street LLC (Christopher Buchan, manager of record). In August of 2007, it applied for (and subsequently received) permission to convert the property from ten apartments into two units, including adding a garage in an existing rear ell. 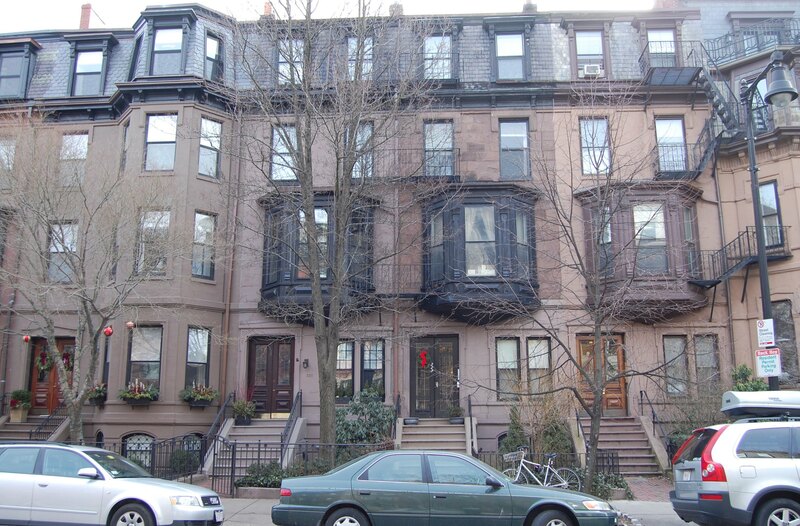 On November 20, 2008, 319 Beacon was purchased from the 319 Beacon Street LLC by general contractors and real estate developers John P. Holland and Joseph Holland, as trustees of the HD 319 Beacon Street Realty Trust. The previous proposed remodeling had not been completed, and in July of 2009, the Hollands filed for (and subsequently received) permission to modify the plans and convert the property from ten apartments into a single-family dwelling. On October 15, 2009, 319 Beacon was purchased from John Holland and Joseph Holland by Adam M. Zaiger, trustee of the 319 Beacon Street Nominee Trust. 319 Beacon remained a single-family dwelling in 2016.